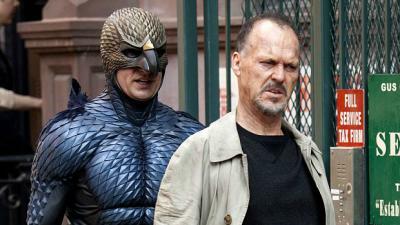 You might call Birdman a coming of age tale of sorts. For Michael Keaton, it marks not only a revelatory comeback as the movie's lead, but a quantum leap in artistry from the glory days his past work (Tim Burton's Batman). For director Alejandro Gonzalez Innaritu, it's a meta masterwork that both embodies and departs from the weighty ambition and humanism of his previous career (recall the powerful Babel, 21 Grams, or Amores Perros). Brilliantly, Birdman seems like an apparent mini-allegory for the career of Keaton himself. As Riggan Thompson, Keaton embodies a washed up artist in a midlife crisis. Like Keaton, Riggan was the star of a corporately-driven movie franchise (the voice of his character, Birdman remains in his head throughout) that retains only weak shades of its past household quality. To combat the idea that he doesn't matter, Riggan launches an adaptation of a Raymond Carver novel, which he writes, directs, and stars in. The play itself is featured in short segments, offering momentary reflections of Riggan's personal life and grapplings with existential inadequacy. With the help of his manager, Jake (the excellent Zach Galafaniakis), Riggan brings on board Mike Shiner (Edward Norton), a prime-time actor who compliments Riggan's ego and ambition with the promise that no one's opinion matters. As Birdman progresses, Innaritu dazzlingly melds art and life itself, gliding on a camera that seems to never stop, bringing an intoxicating cohesion to the interlocked essences of Riggan's play and Riggan's life. Birdman isn't just about Riggan, though. Putting each of its prominent characters on full display, Innaritu creates an vast, complex mosaic of people caught in the stream of life. While Riggan desperately grasps for some semblance of meaning, Mike pretends to reject the very thought thereof, even though he readily admits that the only truth he ever tells is in his acting. Riggan's daughter Sam (Emma Stone), a recovering drug addict, refuses to believe that she is beautiful after years of having a father who told her she was only to make up for his neglect. Riggan and his wife manage the thought of parenthood, while Mike's sexual frustrations appear both in real life and on stage. Inarritu's no newcomer to this human struggle -- just watch Babel and feel the full force of it. But with his latest, it is less of a grasp to reconcile human differences than a chuckle into the void, and an odd reassurance that things will be okay. Birdman has a self-awareness that is unseen in his previous films. From it's reflexive narrative, to its pokes at the pretense of Riggan's work, it's a portrait of art in conflict, but also a movie with a working mind and existential context. Neither of which is it afraid to brandish and tear to shreds simultaneously. It's commentary on philosophy and high art is a humorous self-examination, but also a continuum of the filmmaker's complexity and ambitious search for the answers to a range of questions. Cinematographer Emmanuel Lusbezki, the master behind The Tree of Life and Gravity, crafts a visual feast, swooping between scenes, from Riggan's play to reality and back, with shots that never seem to end. In tandem with Inarritu's vision, he seamlessly creates a thematic continuum that spans each of the film's dimensions. Each actor gives a performance that could be defined as career defining, from Keaton's classic rebirth, Norton's subtly implicative support, and quite possibly the finest work of Emma Stone's budding career. The less prominent feature roles are handled wonderfully by Naomi Watts, as Mike's love interest and acting partner, as well as Amy Ryan and Andrea Riseborough as Riggan's past and present lovers. At the movie's heart is a screenplay that brilliantly handles a melting pot of ideas and real world parallels. Inarritu and his team, comprised of Nicolas Giacobone, Alexander Dinelaris, and Armando Bo, have penned something for the time capsule. But Birdman is a movie in which everyone has a part. Every performance, every swoop of the camera, every moment that confounds, humors, and connects, adds up to a full-force movie miracle. You won't see anything else like it this year, and maybe not for those to come.